I fire up Photoshop and start working on my first custom cover for The Force Awakens. 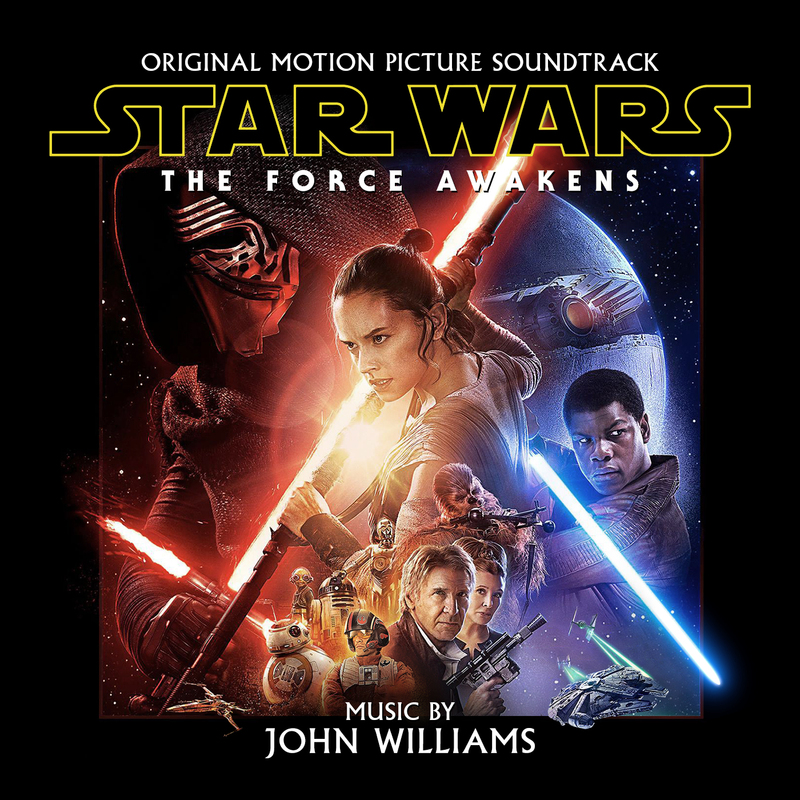 I still can’t believe that we’re actually going to get a new John Williams Star Wars soundtrack. What classic themes will he incorporate into the score? What about the tracklist? And what will the cover art look like? Am I going to love it? God-damn I just have to. 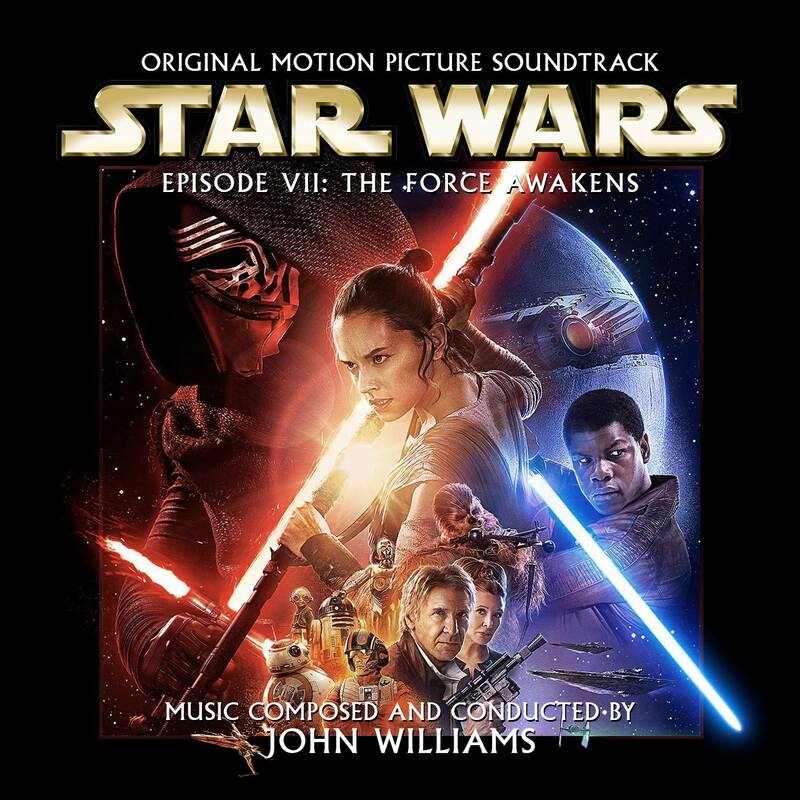 This is a bloody new Star Wars score. Hell yeah! Tonight’s the night! Tonight at point midnight I’ll be sitting in the largest cinema around town and watch an all-new entry of the legendary Star Wars saga. It’s only a few hours to go and I’m already shaking like a schoolboy. The last time I’ve been that giddy with excitement was at the premiere of the last Indiana Jones. And we all know how that one ended. So let’s calm down a bit and spend the remaining hours reasonable. Time to post some custom covers! 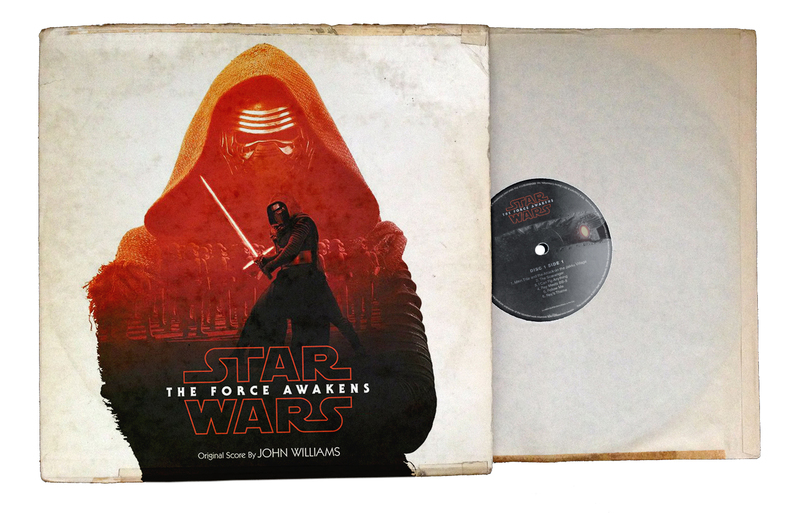 Are you in need of some alternate artworks for your digital copy of The Force Awakens? Well, my name is heidl, and I’m here to rescue you. The retro force is strong with JJ Abrams’ first installment in the Star Wars franchise and you can perhaps imagine how much I dig that decision. From the return of the legacy characters to the visual style and even the usage of classic font types, The Force Awakens is a real blast from the past. 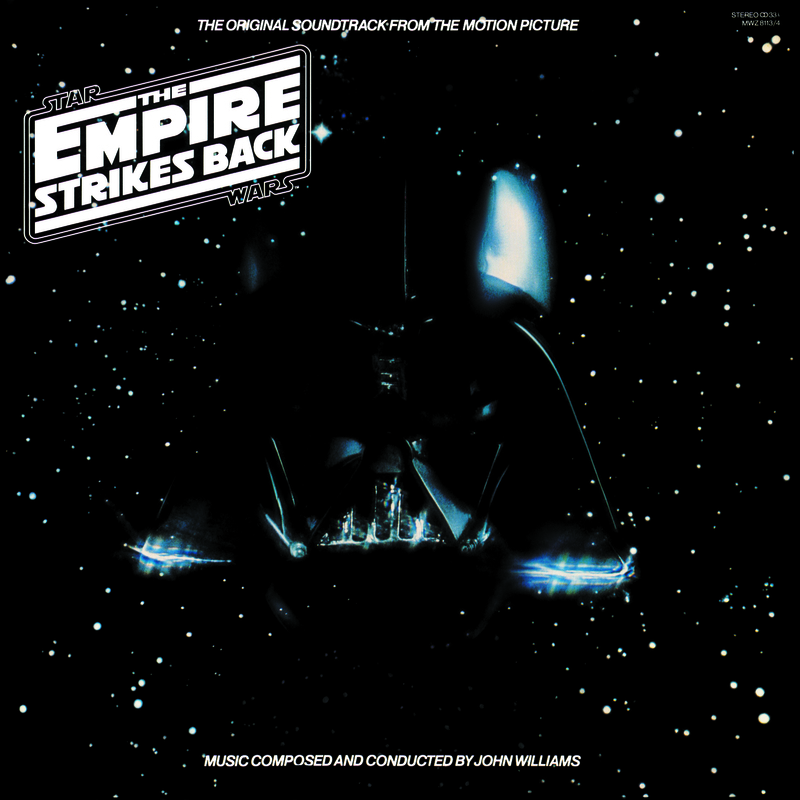 And the official soundtrack (#1) makes no exception here, John Williams’ seventh Star Wars score features the same bare bone artwork as A New Hope did thirty years ago. How could I not go full circle from there and come up with two additional original trilogy inspired covers? I just had to make the two customs above. For once I mimicked the Empire Strikes Back album cover in facsimile and applied it to an official Star Wars print from artist Dan Mumford (#2). And it worked out wonderfully. And I also created an homage to Jedi which was a bit trickier (#3). Partly due to a source image featuring a big watermark right at the center. But this fan poster by deviantArt member “angelsaquero” was just too awesome – and it inspired me to make these cover replicas in the first place. After some troublesome removal of the dA logo, I ended up only using the drawn hands and parts of the lightsaber hilt. The background image’s just a recoloured version of the original Return of the Jedi cover. And I added my own version of the crossguard lightsaber, a customized TFA logo and also a small, round thing which is totally no moon! I tried to enhance the official artwork as well, because – quite honestly – I found the lack of proper typography disturbing. But in the end it wasn’t exciting enough to feature it within this post. 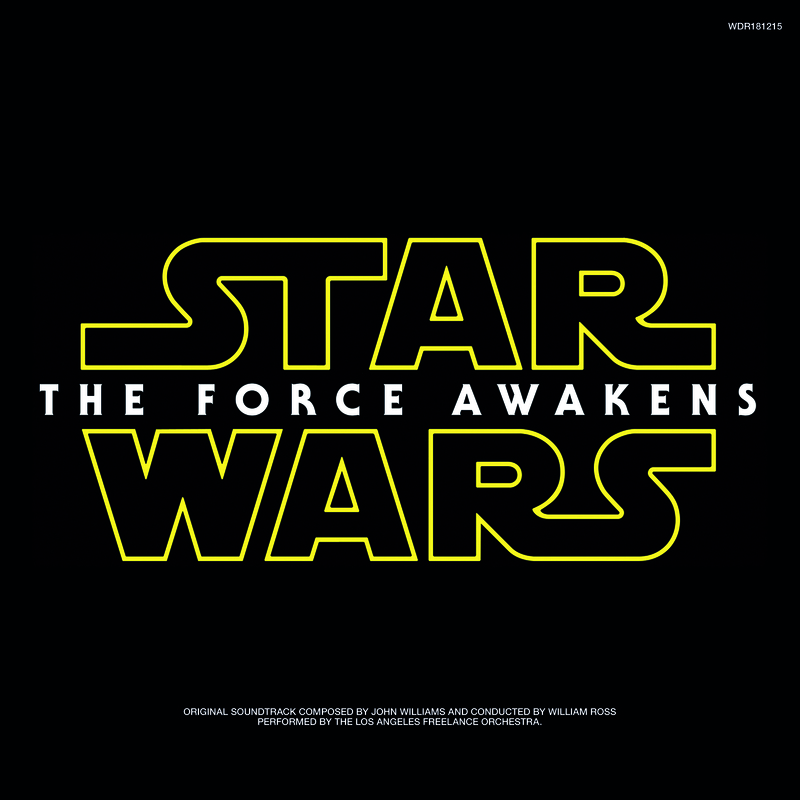 All of the covers above feature the official The Force Awakens logo. And they’re also entirely based on official marketing material, taken from either books (#6, #7) or promotional art. The most challenging one in this set might have been #4, which coincidentally also was my very first custom cover for this series. It went through numerous iterations until I was finally happy with it. Custom #8 might be recognizable for some of you, for it was heavily influenced (and I assume the same goes for the depicted sequence within the film) by Francis Ford Coppola’s masterpiece, Apocalypse Now. I even went so far and created the Star Wars logo in the same style, but it looked rather awkward, like a cheap spoof. The last one in this bunch (#9) initially featured a plain white background, but somehow it felt a bit too empty for my tastes. I admit applying the retro Vinyl style to every other custom cover gets tired after some time, but here it added a much needed wave of excitement. To make up for it I’m going to show you the full artwork below, this time in a really, really old presentation. This brings us to the really awesome stuff. The ones that above anything else deserve the term “custom cover”. So if you’re here for some really, really alternate cuts, these are most certainly the custom covers you’re looking for. I started by using one of my personal favourite fan artworks out there: Freelance artist Laura Racero created a wonderfully classic art print for The Force Awakens that reflects the true vibe of the old days. I really hesitated to alter anything in it for this custom cover (#10), yet to be able to put it in a square canvas, I had to recreate a few bits. By downloading publicity stills of our three main characters from the MovieStillsDB, I was able to cover the jam-packed lower third of her poster and thus create room for my version of the film logo. And I also changed the model of the Millennium Falcon, since hers featured the old circular sensor dish from the original trilogy. But beside that all praise belongs to Laura. Especially for drawing the arguably best version of Kylo Ren I’ve seen so far. Following that is my album art take (#11) on Drew Struzan‘s D23 Expo poster. By adding a retroesque white frame I was able to cover up the somewhat awkward addition of Han Solo. And it allowed me to use this fantastic vintage version of the Star Wars logo. I love that one! As for the sphere, to me it doesn’t represent a planet so much as a star. It reminds me heavily of the binary sunset scene from “A New Hope”, which is great because it adds an extra layer of depth to the piece: Ren cutting down the dawn of a new era and eradicating the new hope. I’m again lying in bed, trying to catch some sleep before the film premieres at midnight. A rather senseless endeavor, to be honest. Instead I’m relieving my thrill of anticipation by writing off a storm of feelings. But I know time is limited and what was too many hours to go before, is now merely a few hours to go. So I’ll just give you a quick rundown of the remaining covers. #13 is based on a Kylo Ren painting by art hobbyist Jane Markelova. I added some missing elements to make it square and also placed a custom logo on top of it. A really dark and ominous piece of work. #14 was again created by “angelsaquero“. A genuine recreation of Drew Struzan famous Revenge of the Jedi poster. #15 is an original artwork created by Joey Spiotto. 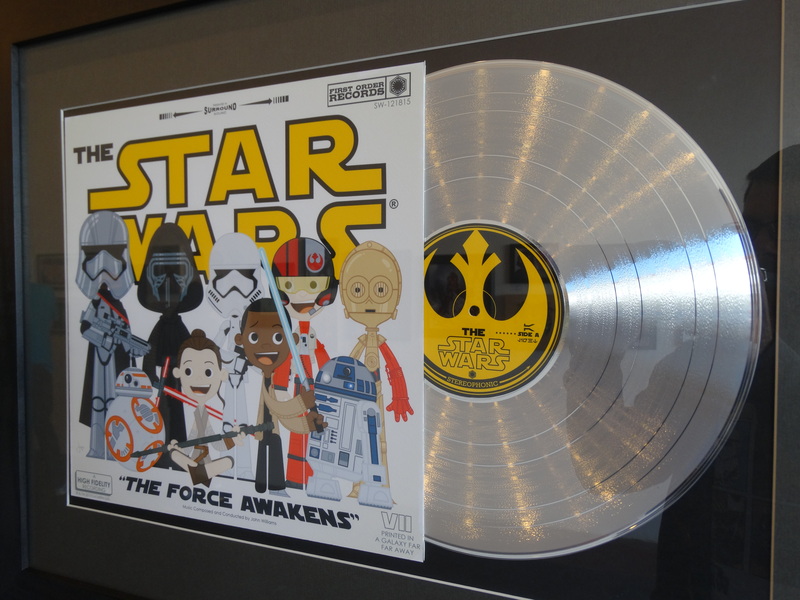 He even produced a real mockup for the “Art Awakens” exhibition at the Gallery 1988 in Los Angeles. #16 is based on yet another fan poster from deviantArt user “Elswyse“. I tried to imitate the 1997 Special Edition designs by using this custom logo. #17 is based on an official Kylo Ren wallpaper. I used the prequel trilogy logo design on this one and it’s really strange how dated and ultimately pejorative this design has came to be in my mind. 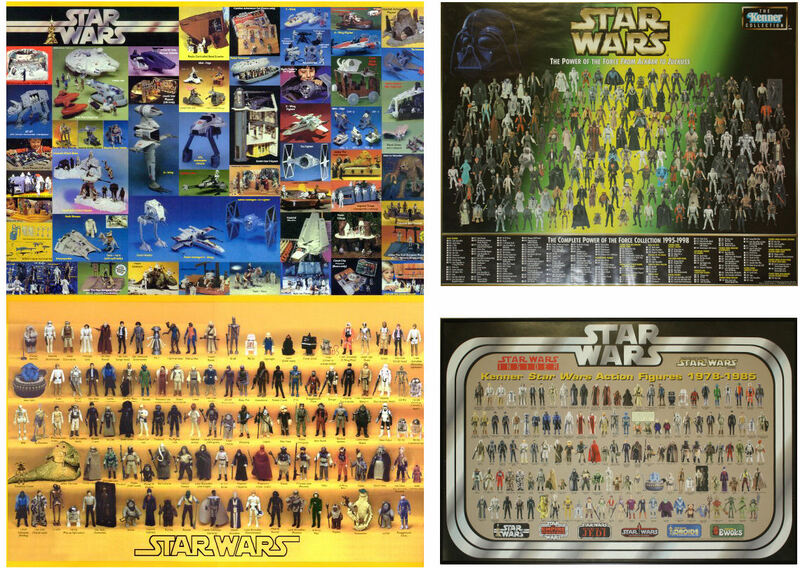 Only now, so close to a completely new chapter of the Star Wars saga, I’ve realized how much I actually loathe the clean and synthetic look of George Lucas’ prequels. #18 is another prequel design. I heavily edited an official wallpaper for this one and turned it into a fictional Ultimate Edition. Do you remember? 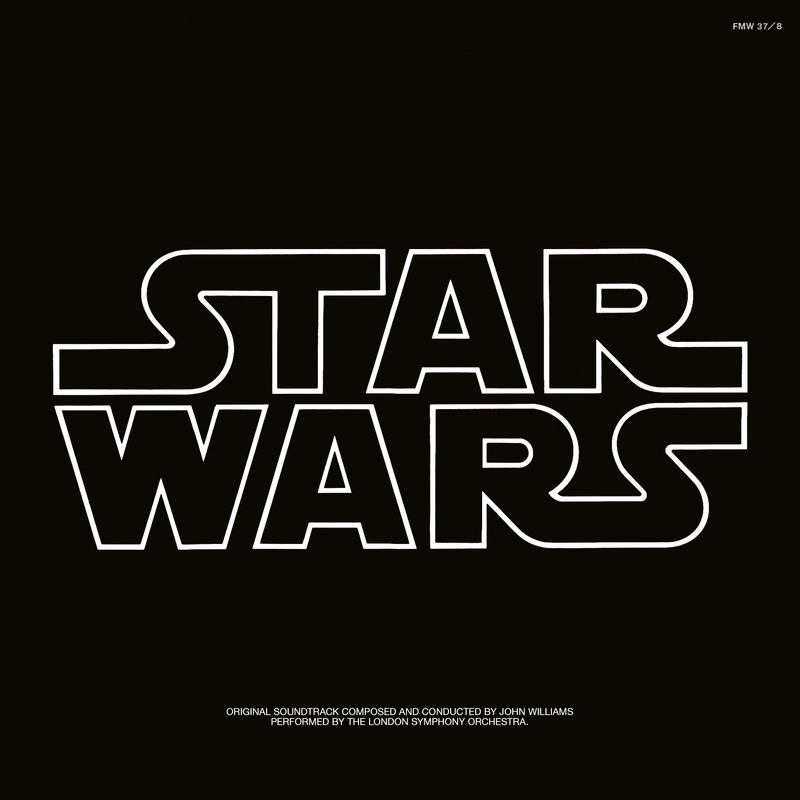 That was the other The Phantom Menace release with that ridiculously long tracklist and the downright ridiculously short tracks (which heinously crossfaded in each other). The last one (#19) is another official key art treated to look like the Sony Classical albums from 2004. So, that’s it. I used the force of Photoshop to create some impressive, most impressive custom covers. Or did I? Well, I tried to… I published most of these customs over the last ten days on my Twitter and facebook accounts and they generated a lot of buzz. At least for custom cover arts and for how much of a buzz a fanmade album cover is able to create. After all my audience for these kind of things is still very manageable. But I’m very thankful for all your comments, likes and shares! This is for you. A final thought… I find it really interesting how much emphasis is laid upon the dark side in all of those official artworks. Disney and particularly JJ Abrams and his partner Lawrence Kasdan really hit the nail with the design of the new baddie, Kylo Ren. His striking pose is a real eye-catcher and already a unique character in itself. The dark side of the force is stronger than ever. If history really does repeat itself, then we’re up for the next “I am your father” moment. And that is indeed true. And surely not impossible. Over the last few weeks I was working on a digital booklet, since the official release didn’t feature one. The PDF file below is a genuine recreation of the original CD booklet, using official promo material only. I took the liberty to change the aspect ratio from square to widescreen 1080p to offer a better viewing experience on digital devices. There is only one word for it, or maybe two… unbeliveable awesome! I have beed following your site a long, long time ago, I am surprised every time when you are making new covers! Finally I make a comment. Keep on the amazing work! As disappointing as the movie was for me (and, sadly, the music too), these covers are anything but. They are beyong excellent, and the time and effort you put into this series really shows. And the fact that you have talent and a really good eye for composition and how to treat fonts only makes these more satisfying. Yes, please do the same for The Last Jedi!I loved your covers for The Force Awakens and would like a cover to make all the other soundtracks I have for Star Wars!